6 YRS Hangzhou Depai Machinery Co., Ltd.
Machine is characterized by compact strrctute, fine workmanship, big pressure, high precision and easy and reliable operation, ect. The Warranty is one year and if the machine is damaged by natural not by human, we can send the new parts to you for free. 2. Q: What is the terms of payment you accept9 A: 30% T/T in advance, 70% T/T balance before delivery. 9 YRS Pingyang Dush Machinery Co., Ltd.
3 YRS Higee Machinery (Shanghai) Co., Ltd.
7 YRS Suzhou Ruicai Electron Co., Ltd.
7 YRS Wenzhou Jiamao Machinery Co., Ltd.
4 YRS Cangzhou Xulin Carton Machinery Co., Ltd.
2 YRS Zhengzhou Perfect Imp & Exp Co., Ltd. 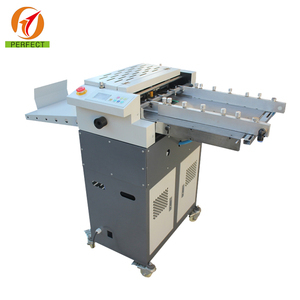 Application of Automatic Adhesive Sticker Half Cutting / Creasing / Perforating Machine: Function: Half cutting, scoring, perforation, cutting, creasing. Suitable material: Business card, photo, adhesive sticker, greeting card, paper, book cover etc. 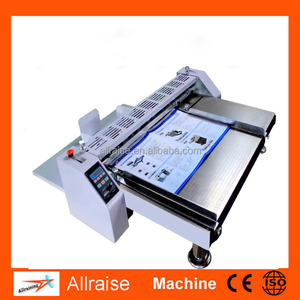 Technical Parameter of Automatic Adhesive Sticker Half Cutting / Creasing / Perforating Machine: Model YH-480 YH-660 Max. 5 YRS Hebei Soome Packaging Machinery Co., Ltd.
3 YRS Hebei Bestice Commerce & Trade Co., Ltd.
6 YRS Lanxi Jinhua Printing Machinery Co., Ltd.
3. It is convenient and fast to assemble, disassemble and locate the modules. 5. Can crease 6 lines (spine, hinge & overhang cover edges) at the same time. Packing Weight: Depends on the type of the products. 1 YRS Hangzhou Caide Office Equipment Co., Ltd.
Ruiting machines have been acceptable for the customers from home and abroad ,due to their outstanding features, high quality and good service. Technical Parameters: High strength due to one piece casting by using top-ranging material for machine body. Sliding bearings are made of high quality alloy cooper,thus to get effect of anti-frietion and shake reducing. 1 YRS Hangzhou Fuyang Sigo Office Supplies Co., Ltd.
8 YRS ZheJiang Good Machinery Co., Ltd.
11 YRS Shanghai Printyoung International Industry Co., Ltd.
12 YRS Shanghai Xsheen Machine Electron Technology Co., Ltd.
8 YRS Hangzhou Befitter Machinery & Electronic Co., Ltd.
2 YRS Hangzhou Seven Office Supplies Co., Ltd.
NO MOQ 3 Years Warranty paper manual creasing and folding machine paper manual creasing and folding machine Model No. cutting thickness 50mm Creasing Style Creasing and Perforating Pay $200 if delivery delay, Pay $50 if problems don't solved. Contacts: Mob/Whatsapp: +86 15869037467 Order reach to $10,000 , you can get a mobile phone. 8 YRS Cangzhou Kingsun Imp. & Exp. Co., Ltd.
supportLists]&gt; 1. &lt;! supportLists]&gt; 4. &lt;! supportLists]&gt; 7. &lt;! 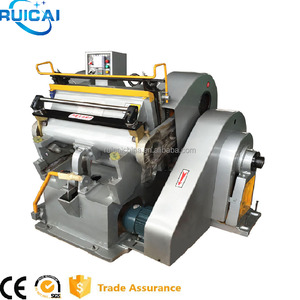 2 YRS Hangzhou Befitter Machinery & Electronic Co., Ltd.
1 YRS Dongguang Zhizhen Pack Machinery Co., Ltd.
9 YRS Ruian Mingyuan Machinery Co., Ltd.
11 YRS Ruian Zhengda Machinery Co., Ltd.
After-Sales Service * Training how to instal the machine, training how to use the machine. After one year, the seller will supply the spare parts to buyers as the cost. The machine service is all around the machine life. (3) Side frame, to fix two main shafts by bearing, small shaft and bush. (4) Main shaft, to support creasing wheel and transmission wheel. (5) Transmission part, to complete creasing by rotary motion of two main shafts drived by hand lever, motor. 3 YRS Suzhou Ruicai Electron Co., Ltd.
4)The linear guide of the flatbed cutter ensures high speed and few errors. 6)The flatbed cutter has an LCD touch screen in English or Chinese. After-Sales Service * Training how to instal the machine, training how to use the machine. 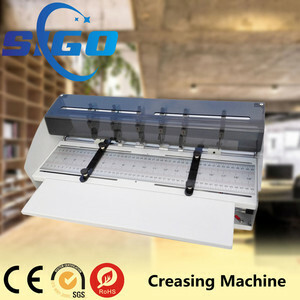 Alibaba.com offers 20,162 machine crease products. About 45% of these are paper processing machinery, 13% are other packaging machines, and 4% are paper product making machinery. 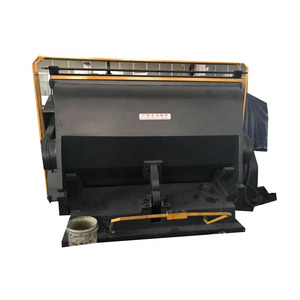 A wide variety of machine crease options are available to you, such as die-cutting machine, paper cutting machine, and corrugating machine. You can also choose from yes, no. As well as from free samples, paid samples. 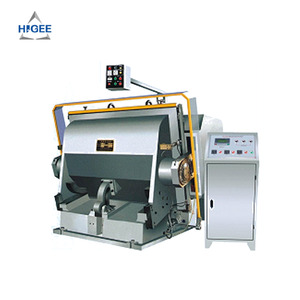 There are 20,162 machine crease suppliers, mainly located in Asia. 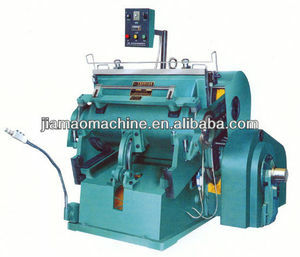 The top supplying country is China (Mainland), which supply 100% of machine crease respectively. 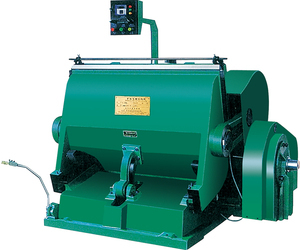 Machine crease products are most popular in Mid East, Domestic Market, and Eastern Europe. You can ensure product safety by selecting from certified suppliers, including 3,009 with ISO9001, 1,502 with Other, and 62 with FSC certification.